We spoke about our way of playing and we didn’t put that on the show against one of the better teams today. 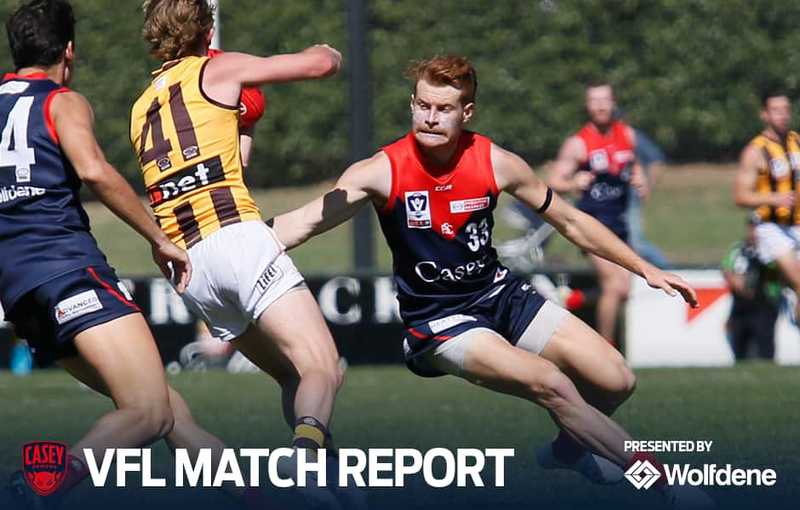 A YOUTHFUL Casey Demons side has fallen by 62 points to a dominant Box Hill Hawks at Box Hill City Oval on Sunday afternoon. Casey Demons 4.18 (42) defeated by Box Hill Hawks 15.14 (104). The reigning premiers showcased their might in the opening quarter building what became an insurmountable lead. Head coach Jade Rawlings did not miss words when talking of the Demons lacklustre display and the team not playing the way Casey has valued. “It wasn’t us out at our best … we were outplayed in every facet of the game,” Rawlings told Melbourne Media. The Demons fought back at the beginning of the second quarter playing their best footy of the day, after Rawlings had implored his team to focus on pressure football, but it did not result on the scoreboard. While at the other end, the Hawks continued to pile on the agony, forcing Casey into costly turnovers, resulting in five goals and all but securing the victory. Inaccurate kicking did not help Casey’s chances, recording 22 scoring shots, but only registering four majors. “Many of our shots were not that simple, which is down to the pressure Box Hill put on us,” Rawlings said. Rawlings acknowledged goal kicking was another area they would need to improve on the training track this week. “Extremely disappointing … everything is geared up to put on a show for round 1 … some smaller details in our game that were so far from the mark it wasn’t funny,” Rawlings said. Box Hill forwards Jackson Ross and Mitch Lewis were dominant for the Hawks, combing for nine goals in the victory. The big bodied pair controlled the air and were never challenged by the Casey defenders. “Aerial play is not a strength of our club at the moment … we dropped every mark we were attempting to take and couldn’t defend them going for marks,” Rawlings said. But a standout in the match was Corey Maynard recording a game-high 27 disposals and thrusting his name into the selection mix for Melbourne. “We were pleased with Maynard, he put in a consistent four quarter effort,” Rawlings said. Another highlight was the play of debutant Kade Chandler scoring two goals and gathering 17 disposals becoming one of best for Casey on a difficult day. “Young Chandler did well as a first-year player and as a forward, especially getting not very good service,” Rawlings said. AFL scheduling also proved an impact, with AFL-listed players Marty Hore and Stretch being sat in the opening quarter due to minutes restrictions. Stretch made an immediate impact in the second quarter when he took the field racking up six disposals, and could be in the selection mix for the Melbourne Demons match in Sydney on Thursday night. But there weren’t many highlights on a difficult day in the sunshine. A positive was the team came away unscathed from the match with no injuries. Casey will look to rebound quickly from the heavy defeat, as the Demons host North Melbourne next Saturday at home. Hoping the friendly confines of Casey Fields will see the Demons return to the form they possessed in season 2018.